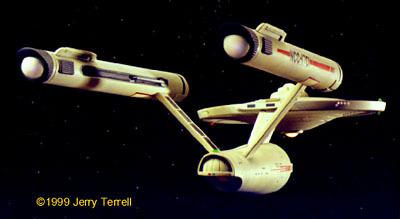 This is a 28" scratchbuilt TOS Enterprise NCC-1701. All major parts are wood. Most were turned on a lathe. Detail parts are plastic and brass. 12 volt window and bridge lighting (some windows enhanced for photo) run through hollowed areas in wood. 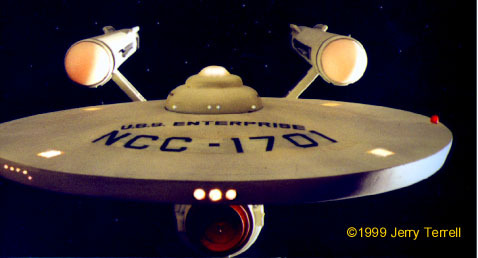 Engine nacelles contain 6 randomly blinking LEDs in frosted dome. This represents approximately six months' work. 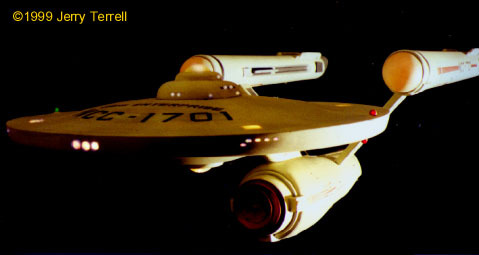 I used Enterprise blueprints (correcting known inaccuracies) and available photos for reference. I tried casting the parts of this model in clear resin and fiberglass for a better lighting effect, but it was too costly. A classic view of the ship, partially in shadow and showing off the excellent lighting effects. Another classic view, looking head-on at the saucer. Again the lighting is well illustrated by this picture.